Openframe is an open source platform for artists, curators and art enthusiasts to share, discover and display digital art. Openframe is free. Anyone can set up a frame using an HDMI display and a Raspberry Pi. Openframe is a collaborative, on-going project. The platform consists of an API, a web app, and software for the RPi that currently supports images, video, web-based artwork, and shaders. Our goal is to create a system that is accessible and extensible, allowing artists to easily add support for new digital formats. Don't be limited by the platform. Write an extension that supports your artwork, whatever it may be. Manage your digital art displays. Contact us at hello@openframe.io. We'd like to learn more about how Openframe can work for you. Send us an email at hello@openframe.io if you have ideas on how to improve or expand Openframe. In the same way painters stretch their own canvases, digital media artists need to have full control over their tools. 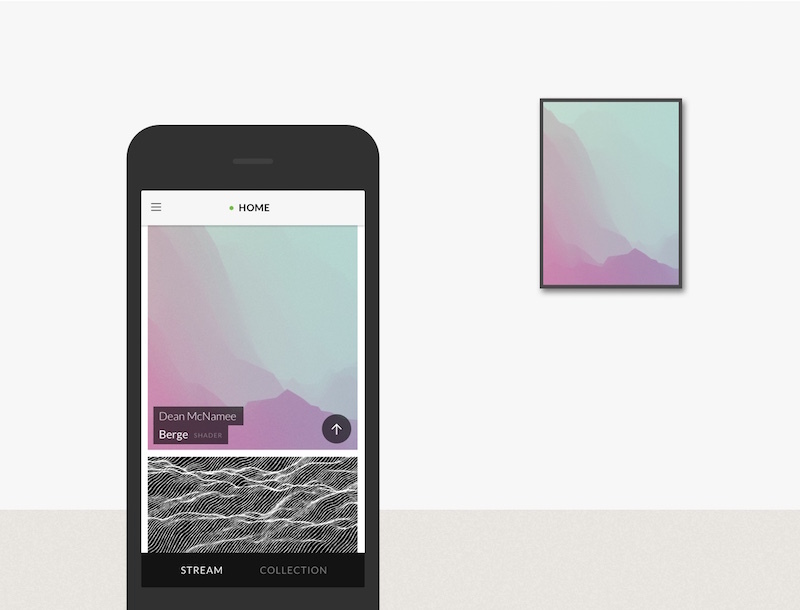 Openframe promotes experimentation with this new medium — it allows artists to explore new artwork formats and new ways to reach an audience. We want to build an open source platform that can be modified and extended to support new media types and sensor-based artwork, and that can be easily set up using a range of inexpensive hardware (Raspberry Pi, Odroid, etc.). With Openframe, we want to create a conduit through which an audience can experience and appreciate art in new ways, and which allows artists to give new life to their work. What artwork can I display? The platform uses 'format' plugins which describe how to run artworks. At present, we'll be releasing plugins for images, video, websites, and shaders, but artists are free to create extensions which can run other types of artwork. No content is stored on the Openframe server. It's up to you to make sure you have the permission of the content owner to display the work. The installation seems complicated, I just want to buy a frame. Openframe is not a product. However, there are an ever growing number of existing commercial products that you can buy, plug to the wall, and voilà — they work. Check out Electric Objects or Framed. Jon Wohl and Ishac Bertran started Openframe in spring 2015.